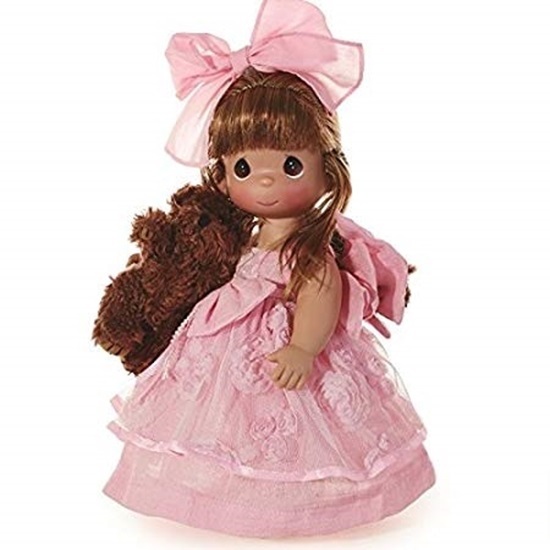 This adorable beauty from Precious Moments is ready to snuggle up with your little one. In her beautiful pale pink dress adorned with flowers and pearls she is sure to steal your heart. She is 12 inches tall and her head, arms, and legs are jointed. Her long auburn rooted hair is braided down her back, with tendrils and bangs framing her face. She has brown tear drop shaped painted eyes. A matching pink bow sits atop her head, and yellow mary janes complete this sweet dreams ensemble. In her dainty hand, she holds a soft brown plush teddy bear. She is perfect for ages 14 and up.